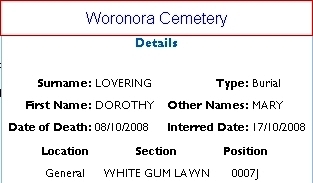 Dorothy passed away on 8 October 2008. 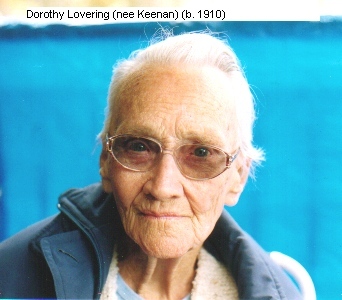 She was the last member of the second generation of "Batlow Keenans". Photograph by Peter Keenan in 2003. Buried: 17 October 2008, Woronora Cemetery, 121 Linden Street, Sutherland, NSW. "Miss me a little, but not too long and not with your head bowed low. Remember the love that we shared, miss me but let me go."